A successful election lawsuit filed against the city of Ann Arbor led last month to city council action to place a charter amendment in front of voters on Nov. 4, 2014. The amendments – which establish eligibility requirements for elected and appointed officials – were placed on the fall ballot in a July 21, 2014 vote of the council. And now the ballot language for the two proposed Ann Arbor city charter amendments has been certified by Michigan’s attorney general as meeting the requirements of the Home Rule City Act. 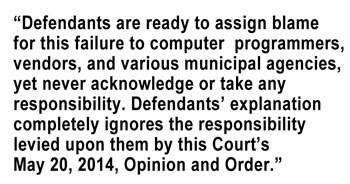 The AG’s office communicated its conclusion in an Aug. 8, 2014 letter to Gov. Rick Snyder’s office. This article was set up with an automatic publishing time: 8 p.m. Aug. 5, 2014. In this file The Chronicle will record summarized tabulations of early, informally-reported, completely unofficial election results – in city of Ann Arbor races for mayor and city council. The city of Ann Arbor is divided into five wards. The headline is drawn from a tradition in Ann Arbor’s Internet culture dating back to the mid 2000s – the days of the now defunct community blog, ArborUpdate. At the moment the polls closed, local attorney Dave Cahill would reliably post a three-word comment: alea iacta est (the die is cast). The Latin phrase is attributed to Julius Caesar as he crossed the Rubicon. The results reported here come directly from individual precincts as the paper tapes are printed out by voting machines. They should be considered informal and unofficial. Unofficial results will also be reported by the Washtenaw County clerk’s office on its Aug. 5, 2014 election results page. The following block of text will be replaced with a time-stamped, updated version about every 10-15 minutes. To see the most recent results, please refresh the page manually. In the Ward 1 city council race, with 10 of 10 in-person precincts informally reporting, including absentee ballots, ADAMS has received 840 votes (43%), and KAILASAPATHY has received 1113 votes (56.9%). 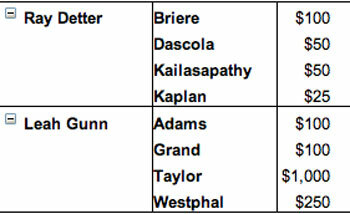 In the Ward 2 city council race, with 7 of 9 in-person precincts informally reporting, including 2 of 2 absent voter count boards, KAPLAN has received 1163 votes (41.8%), and WESTPHAL has received 1615 votes (58.1%). In the Ward 3 city council race, with 4 of 9 in-person precincts informally reporting, including absentee ballots, DASCOLA has received 572 votes (27.3%), GRAND has received 1126 votes (53.8%) and MCMULLEN has received 394 votes (18.8%). In the Ann Arbor mayor’s race, with 32 of 48 in-person precincts informally reporting, and 7 of 7 absent voter count boards reporting in, BRIERE has received 2411 votes (20.1%), KUNSELMAN has received 1931 votes (16.1%) PETERSEN has received 1830 votes (15.3%), and TAYLOR has received 5785 votes (48.3%). Unofficial results for Tuesday’s local primary election races will be available on the Washtenaw County clerk’s election results page. Polls close at 8 p.m. so the earliest results will start showing up on the clerk’s website a couple hours after that. 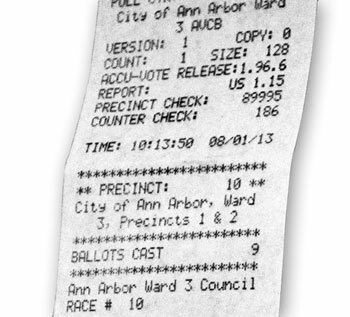 Example of an Ann Arbor voter machine results tape from 2013. We’re asking regular folks throughout the city to visit a precinct after the polls close at 8 p.m. – and report the numbers from the publicly posted paper results tape. 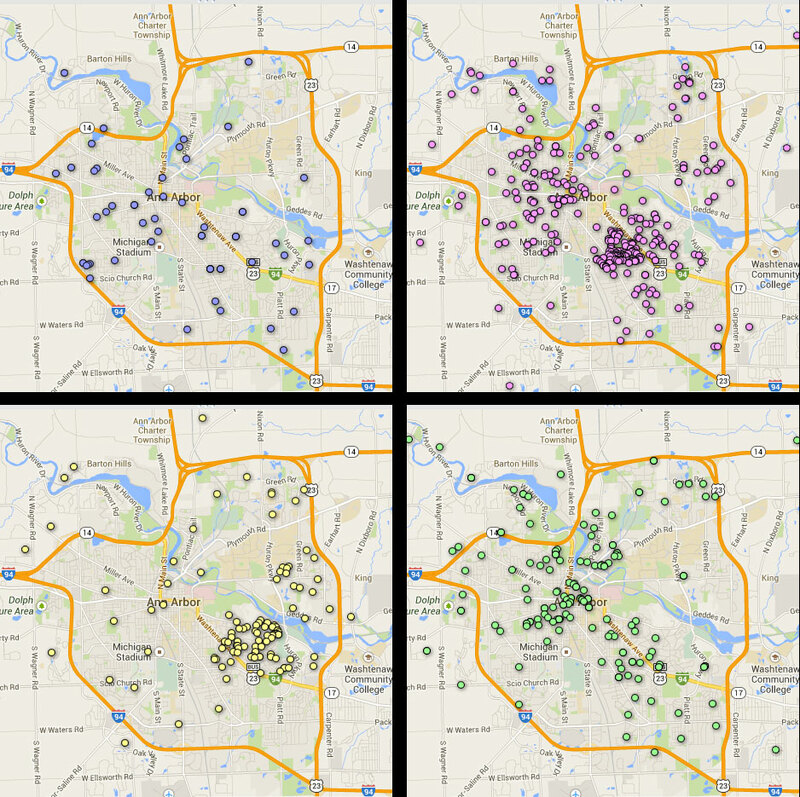 Augmenting the civic satisfaction you’ll get from helping to report on our local democratic doings, you can also earn 1,000 points in the Ann Arbor District Library’s Summer Game. The mechanics of retrieving the game code are included below. Most naturally, but not necessarily, voters would re-visit the place they voted earlier in the day. Or some voters might choose to vote close to 8 p.m. and then just stick around while the polls shut down, waiting for that magical sound of the voting machine printing off the results tape. If you’d like to help out, then please let us know that you’re planning to lend a hand: leave a comment on this article; shoot me an email (dave.askins@annarborchronicle.com); Tweet at me (@a2chronicle), or flag me down if you spot me traveling through town. From July 28-29, several Ann Arbor residents reported being polled by telephone about their preferences in the upcoming Democratic mayoral primary election. The Chronicle has obtained the results of that poll of 435 likely voters by Public Policy Polling (PPP), a North Carolina polling firm. July 28-29, 2014 survey of 435 likely Democratic primary voters by Public Policy Polling. Top Chart among all voters: Christopher Taylor (39%); Sabra Briere (19%); Stephen Kunselman (15%); Sally Petersen (13%); Undecided (15%). Bottom Chart (if the election were conducted among those who disapproved of current mayor John Hieftje’s performance): Christopher Taylor (19%); Sabra Briere (19%); Stephen Kunselman (32%); Sally Petersen (20%); Undecided (9%). They show Ward 3 councilmember Christopher Taylor to be a clear favorite, with about a week to go before the Aug. 5, 2014 primary. Taylor polled at 39% compared to 19% for Ward 1 councilmember Sabra Briere. Ward 3 councilmember Stephen Kunselman and Ward 2 councilmember Sally Petersen polled a few points behind Briere at 15% and 13% respectively. The poll indicates that 15% of voters still haven’t made up their minds. Margin of error for the poll is plus or minus 4.7%. The relatively large four-candidate field is attributable to the fact that no incumbent is in the race. Kunselman was the first of the four candidates to declare his candidacy – before mayor John Hieftje announced last year he would not be seeking reelection to an eighth two-year term. 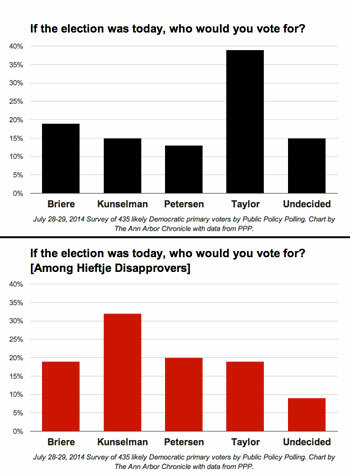 The PPP poll also asked respondents if they approved of the job that Hieftje was doing as mayor. One of the patterns revealed in the analysis of the poll responses is that Kunselman would be a 12-point favorite if the election were held just among those voters who disapproved of Hieftje’s performance. But the poll indicated that only 27% of Ann Arbor voters disapproved of Hieftje’s performance. A polling question that asked about favorable or unfavorable opinions of candidates – independently of an inclination to vote for them – showed Kunselman polling with the highest unfavorable opinion numbers, at 36%. But the “not sure” category for that question polled fairly high across all candidates, ranging from 29% to 43%. The poll also included two questions about future growth – one about downtown development, and the other about the need for an improved train station. The poll indicated 46% support for the downtown projects that have been approved and built in recent years and 39% opposition. The need for a new train station polled at 52%, while the alternate view – that the current station is adequate – polled at 35%. The content of the poll – which evinces some knowledge by its creator of the Ann Arbor political landscape – was not commissioned by The Chronicle or by any of the four mayoral campaigns. Tom Jensen grew up in Ann Arbor and is now director at Public Policy Polling, a firm based in Raleigh, North Carolina. But Jensen still follows Ann Arbor politics. It was Jensen who put the poll together – out of his own interest. And it was Jensen’s voice that was used in the interactive voice response (IVR) technology deployment of the Ann Arbor mayoral poll. The poll drew as a sample all those who’d participated in any primary election (Democratic or Republican) since 2006. Poll respondents included 32% Republican or other non-Democratic affiliation. But based on the results of this poll, he said he was 99% confident that Taylor was going to be the next mayor of Ann Arbor. Over the weekend, local attorney Laurie Longo brought to my attention a political sign placed on North Main by probate court candidate Julia Owdziej – who’s also the incumbent in that race. This Photoshopped “art” took as its starting point a sign that was placed on North Main Street by the Julie Owdziej campaign. 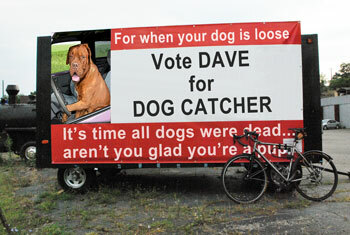 The alteration of the sign was undertaken so readers could be shown the physical dimension of the sign in context, without providing whatever publicity benefit that comes from having a photo of a candidate’s yard sign replicated on The Chronicle’s website. The bicycle is included for a sense of scale. The tagline is a Southern expression I grew up with that essentially means: Do not ask me what time it is, little one. I imagine some readers might agree with Longo’s conclusion – that because the sign is misleading (and violates Ann Arbor’s political sign ordinance), voters should consider other candidates instead. Other candidates in the race are: Jane Bassett, Tamara Garwood, Constance Jones, and Tracy Van den Bergh. That conclusion is, I think, somewhat debatable. Some voters will likely consider that message to be, technically speaking, factually accurate – even if misleading – and within the latitude that is typically afforded political candidates who are trying to market themselves to voters. 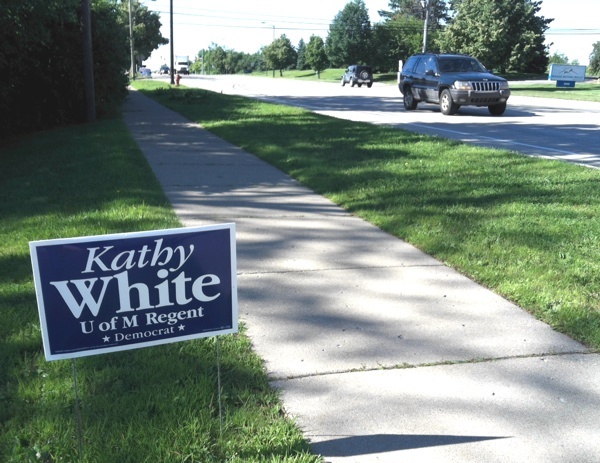 When I reached Owdziej by phone Sunday night (July 27), she indicated that the city of Ann Arbor had contacted the campaign about the sign and that the trailer to which it was affixed was to be removed on Monday. And on Monday it was removed. That’s consistent with remarks made by all probate court candidates in response to a question posed about yard signs at a July 19 forum hosted by the Washtenaw County Democratic Party: They’ll remove signs that are in violation, if the violations are pointed out to them. 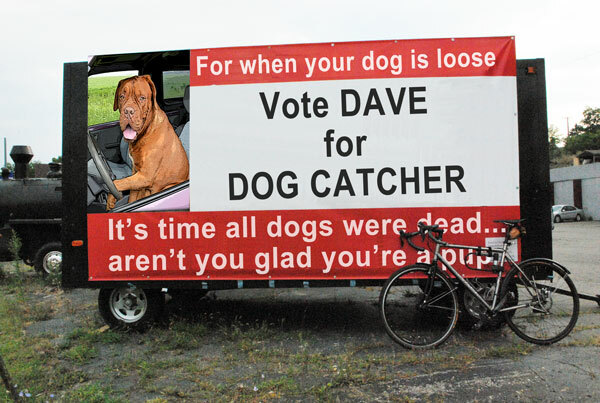 So in this final week leading up the election, I would first like to encourage all candidates – not just those in judicial races – to make sure they adhere to local laws on political signs. If you don’t know that you’re not supposed to have any signs in the public right-of-way or within 5 feet of a sidewalk (with some exceptions), then please read up on the details. 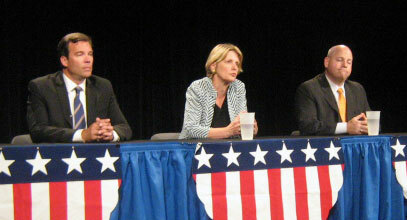 Editor’s note: The candidate forum was moderated by the writer, Chronicle publisher Mary Morgan. Twenty candidates for political office attended a forum hosted by the Arts Alliance on July 23, held at the Michigan Theater in downtown Ann Arbor and focused on the creative sector. The event included presentations by each candidate as well as opportunities for questions from the audience, and drew out policy positions related to the arts. County-level candidates shared their thoughts on the possibility of a countywide arts millage. And mayoral candidate Sally Petersen took the occasion to float the idea of an Ann Arbor city income tax as an approach that would generate more revenue, at the same time shifting some of the burden of local government funding to those who work in Ann Arbor but do not live here. Bryan Kelly, independent candidate for mayor of Ann Arbor in the Nov. 4 general election, made his first public appearance since qualifying for the ballot. “I can say firsthand that being an artist is the toughest damn job in the world. I’d rather run for mayor than keep writing novels,” he quipped. Ypsilanti mayoral candidate Tyrone Bridges shared an example of his daughter’s artwork with forum attendees. Favorite public art named by the candidates included the mosaic adorning the Fourth and Washington parking structure, as well as the half-mile of daffodils planted in The Arb. And Ann Arbor Ward 5 incumbent Chuck Warpehoski delivered his opening statement in the form of a rap. It’s not just about funding, however. Polich stressed the importance of public policy to make the city a fertile ground for the creative sector. Polich reported that the Arts Alliance will be holding a statewide conference called Creative Convergence on March 19, 2015. Thought leaders from across the country, state and Washtenaw County will be coming to speak about these issues, she said. This report focuses on state and local candidates, including the Ann Arbor mayoral and city council races, Washtenaw County commissioners, and state legislators. It also includes responses to a candidate survey distributed by the Arts Alliance prior to the forum. Not included here are statements by the two Congressional candidates who attended the forum: Democrat Debbie Dingell, who’s running in the primary against Raymond Mullins of Ypsilanti for the District 12 seat in the U.S. House of Representatives; and Republican Douglas Radcliffe North, who’s running against incumbent Republican Tim Walberg for the District 7 seat in the U.S. House. According to reports filed with the Washtenaw County clerk’s office, the four Ann Arbor mayoral candidates in the Aug. 5, 2014 Democratic primary have raised a total of $153,847 in itemized cash contributions. The filing deadline for pre-primary reports was July 25. 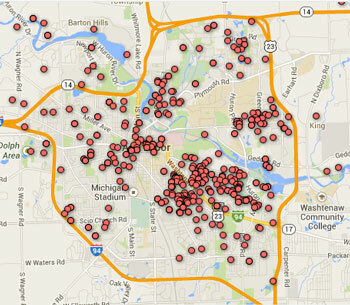 Based on Ann Arbor’s population of about 114,000, that works out to about $1.35 per resident. 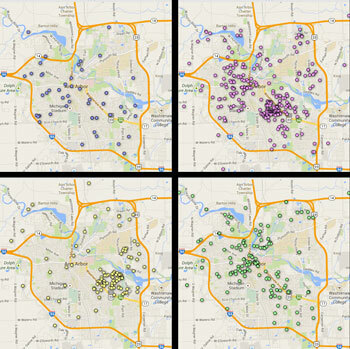 Plots of campaign contributions for four candidates in the Ann Arbor mayoral primary. All four mayoral candidates currently serve on the Ann Arbor city council: Sabra Briere (Ward 1), Sally Petersen (Ward 2), Stephen Kunselman (Ward 3) and Christopher Taylor (Ward 3). Raising by far the most of any candidate was Christopher Taylor with $75,198. (The campaign reported a total of $75,698 in its filings, but that amount was $500 more than the contributions calculated by The Chronicle, based on the campaign finance itemized list.) [link to WC clerk filing by Christopher Taylor] Taylor’s total came from 365 contributions, with an average contribution of $206. Next was Sally Petersen with $44,495 from 133 contributions for an average contribution of $334 per donation. Petersen’s total was boosted with a $10,000 contribution of her own and $15,000 from her husband. The $2,000 limit does not apply to candidates themselves or members of their immediate family. [link to WC clerk filing by Sally Petersen] That total does not include a $5,000 late contribution filed by Petersen, bringing the total she and her husband contributed to $30,000. By way of comparison, when Jane Lumm raised roughly $18,000 for her pre-general election race for Ward 2 council in 2011 and then raised $20,000 for the same period in 2013, those totals were considered remarkable. 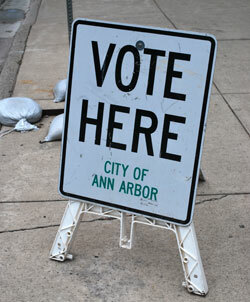 After a federal judge ruled earlier this year that eligibility requirements for elected officers in the city of Ann Arbor’s charter are not legally enforceable, the city council has now voted to put eligibility requirements on the Nov. 4, 2014 ballot for voters to decide. Action came at the council’s July 21, 2014 meeting. The council had one additional meeting on its calendar at which it could have voted to place the resolution on the ballot – on Aug. 7. That’s the last council meeting before the Aug. 12 deadline for certifying ballot language to the Washtenaw County clerk’s office. The Washtenaw County Democratic Party is hosting a forum for candidates in county judicial races this morning (July 19, 2014) at 10 a.m. at the Pittsfield Township Hall on Michigan Avenue near Platt Road. The Chronicle plans to provide a live audio broadcast from the event. The embedded live-stream player below will be replaced with an audio recording after the event is over. Two contested races will appear on the ballot for the Aug. 5, 2014 primary – one for the circuit court and the other for the probate court. 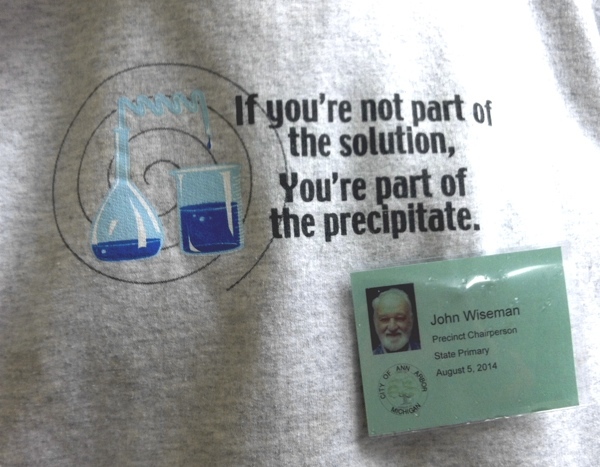 Five candidates seeking to be the next Washtenaw County probate judge answered questions about themselves, probate law and general judicial philosophy at a candidate forum held July 7, 2014. 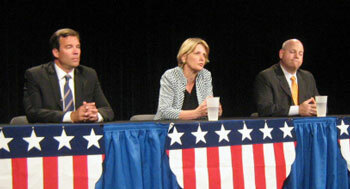 The forum was moderated by the League of Women Voters and broadcast on Community Television Network. Probate court candidates from left: Jane Bassett, Tamara Garwood, Constance Jones, Julia Owdziej and Tracy Van den Bergh. Jane Bassett, Tamara Garwood, Constance Jones, Tracy Van den Bergh and recently appointed judge Julia Owdziej will appear on the Aug. 5 primary ballot. The nonpartisan primary will narrow the race to two candidates for the Nov. 4 general election. 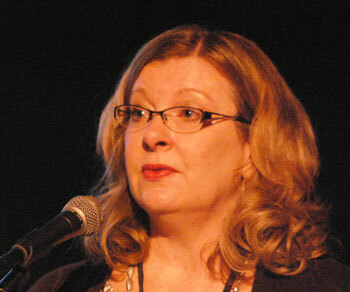 Owdziej was appointed to the seat by Gov. Rick Snyder just last month, on June 2, to fill the vacancy on the court left by Nancy Wheeler’s retirement. The announcement of that retirement came on May 1, after candidates had filed to run. Wheeler was expected to retire at the end of the year, but it came earlier than expected due to health reasons. Bassett, Garwood and Jones currently work in private practice while Van den Bergh is a staff attorney for a legal services nonprofit. On its Vote411.org website, the LWV has posted candidates’ written responses to questions: [Probate court candidate responses] As of July 17, the Vote411.org website had not been updated to reflect the fact that the race now has an incumbent. The county probate judge handles largely estate cases, and issues regarding mental health and addiction. During the July 7 judicial forum, the candidates made opening statements, answered six questions and then made closing statements. The forum was moderated by Miriam Eve Borenstein with questions predetermined by the League of Women Voters after asking for public submissions. On July 7, 2014, three candidates vying to fill a vacancy on Washtenaw’s 22nd circuit court participated in a League of Women Voters forum. Candidates for the circuit court judgeship from left: Michael Woodyard, Veronique Liem, Pat Conlin. Pat Conlin, Veronique Liem and Michael Woodyard will compete in the nonpartisan Aug. 5 primary, which will advance the top two candidates to the Nov. 4 general election. The winner of that contest will fill the open seat left by judge Donald Shelton, who turned 70 in June. According to Michigan state law, only a person under the age of 70 can be appointed or run for the position of judge. The circuit court tries felonies and criminal matters, family law, and civil disputes where claims are greater than $25,000. However, the docket for this particular seat on the circuit court is heavily weighted toward family cases. Conlin and Liem are local attorneys, while Woodyard works in the Wayne County prosecutor’s office. At the July 7 forum, the candidates fielded questions covered topics including: family, the visibility of the court and general judicial philosophy. A second seat on the court is also up for election, as judge David Swartz is at the end of a six-year term. He is running uncontested to retain his 22nd circuit court incumbent seat. At the July 7 LWV forum, the candidates made opening statements, answered six questions and then made closing statements. The forum was moderated by Miriam Eve Borenstein, with questions predetermined by the league after asking for public submissions. The winner of Ann Arbor’s mayoral Democratic primary to be held on Aug. 5, 2014 will face an independent candidate on the ballot in the general election. Bryan Kelly is now qualified to appear on the Nov. 4 ballot, according to Ann Arbor’s city clerk, Jackie Beaudry. A forum for Ann Arbor mayoral candidates is being hosted tonight at 7 p.m. at St. Clare’s and Temple Beth Emeth, located at Genesis of Ann Arbor at 2309 Packard St. The forum will focus on issues of homelessness and affordable housing. 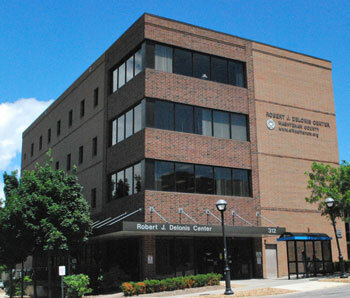 The Delonis Center on W. Huron Street is, for many, the face of Ann Arbor’s effort to shelter the homeless. Competition for the Democratic Party’s mayoral nomination is a four-way race: Stephen Kunselman, Sabra Briere, Christopher Taylor, and Sally Petersen. 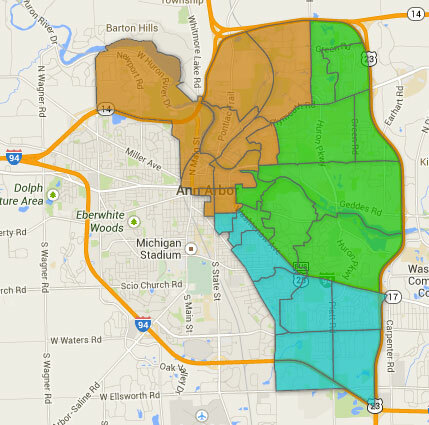 All candidates currently serve on the Ann Arbor city council. Kunselman and Briere are in the middle of their two-year terms, while Taylor and Petersen have chosen to run for mayor instead of seeking re-election to their Ward 3 and Ward 2 council seats, respectively. Tonight’s forum will be moderated by Julie Steiner, former executive director of the Washtenaw Housing Alliance. Candidates will have five minutes to talk about addressing homelessness and increasing affordable housing in Ann Arbor. Candidates will then respond to questions prepared by local advocacy groups, service providers, and faith communities. Questions from the audience will then be answered. 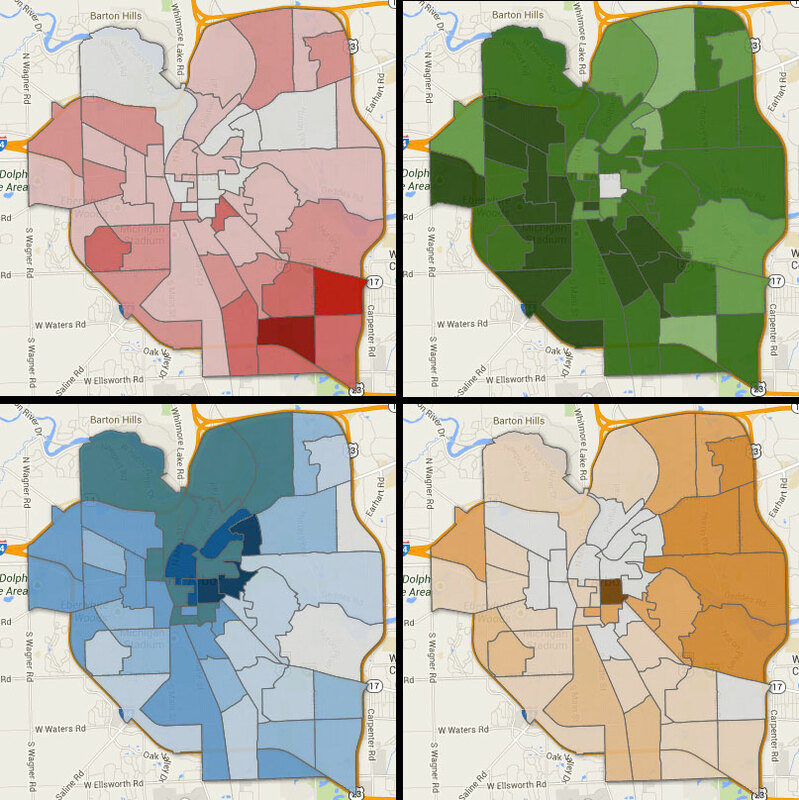 The Orchard Hills-Maplewood neighborhood association is hosting a forum tonight (July 14) at 7 p.m. for Ward 2 city council candidates in the Democratic primary election, to be held Aug. 5, 2014. Group photo of candidates in Ward 1, Ward 2 and Ward 3 at the Ann Arbor Democratic Party forum held on Saturday, July 12, 2014. From right: Ward 1 candidates Don Adams and Sumi Kailasapathy; Ward 2 candidates Nancy Kaplan and Kirk Westphal; and Ward 3 candidates Julie Grand, Samuel McMullen and Bob Dascola. The forum will be held at the Traverwood branch of the Ann Arbor District Library. The Ward 2 city council race features Kirk Westphal, current chair of the city planning commission, and Nancy Kaplan, current trustee on the Ann Arbor District Library board. There’s no incumbent in this race, because Ward 2 city councilmember Sally Petersen is running for mayor instead of re-election. The Chronicle plans to broadcast live audio of the event. The live audio player is embedded below. After the event, it will be replaced with an .mp3 recording. Update: Several .mp3 files broken down by question are now included in the article in place of the live-stream player. 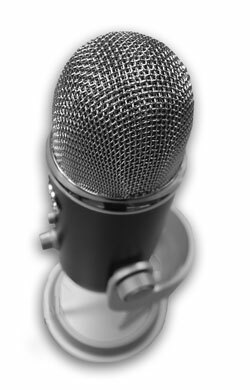 Previous Chronicle coverage of the Ward 2 city council race includes: “Ward 2 Candidate Forum: CTN Broadcast” (embedded video with transcript in a scrolling text box) and “Council Candidates Live: Ann Arbor Dems” (.mp3 audio files). The Ann Arbor District Library staff is hosting an information session for potential candidates running for election to the AADL board. The event will last from 6-7 p.m. in the fourth floor boardroom at the downtown library, 343 S. Fifth Ave.
Three spots on the board will be on the Nov. 4, 2014 ballot. These are non-partisan positions, with four-year terms starting Jan. 1, 2015. The seats are currently held by Barbara Murphy, Jan Barney Newman and Ed Surovell. Update: Newman and Surovell have told The Chronicle that they plan to seek re-election this year. However, Murphy has decided not to run for another term. The Ann Arbor Democratic Party is hosting a forum for city council candidates this morning, July 12, from 9:30 a.m. to 12 p.m. at the Ann Arbor Community Center at 625 North Main Street. Primary elections take place on Tuesday, Aug. 5, 2014. All candidates who have qualified for partisan primary ballots are Democrats. No Republicans have filed in any ward. In Wards 1, 2 and 3, the Democratic primary is contested. Ward 4 does not offer a contested race. Graydon Krapohl, a Democrat who is currently vice chair of the park advisory commission, is the only person who has qualified for the ballot. The race in Ward 5 is also uncontested, practically speaking. Leon Bryson, who will appear on the Democratic primary ballot, has announced that he’s withdrawn his candidacy and won’t campaign for the seat. That means that one-term incumbent Chuck Warpehoski is almost certain to prevail in the primary.